WASHINGTON — Tense arguments broke out at the White House over the past two days as top government officials clashed over how to carry out President Trump’s executive order on keeping together immigrant families at the Mexican border, according to four people familiar with the meetings. The disputes started Thursday night. They continued Friday as Kevin K. McAleenan, the commissioner of Customs and Border Protection, returned to the White House to question how his agency was supposed to detain parents and children together when the law requires that children not be held indefinitely in jail. The bureaucratic battles threatened to undermine Mr. Trump as his administration tries to counter a political crisis driven by heartbreaking images and recordings of crying migrant children separated from their parents and sent off to shelters. On Friday, the president was defiant. “We cannot allow our Country to be overrun by illegal immigrants as the Democrats tell their phony stories of sadness and grief,” Mr. Trump said on Twitter. But inside the White House, the arguments echoed the chaos at American airports after Mr. Trump’s ban on travel from predominantly Muslim countries. The ban, issued days after he took office, surprised Border Patrol agents and State Department consular officials. Officials at the southwestern border are struggling to obey Mr. Trump’s demand to prosecute people who illegally enter the United States — ending what the president has reviled as a “catch and release” policy — while also following an executive order he issued Wednesday to keep migrant families together as they are processed in courts. But as with the case of the travel ban, the reality of a vastly complicated bureaucratic system is colliding head-on with Mr. Trump’s shoot-from-the-hip use of executive power. Even on Wednesday, Mr. Trump repeatedly changed his mind about precisely what he wanted to do, and how, until shortly before he signed the order. Thursday night’s meeting was held in the White House Situation Room and lasted at least 90 minutes, according to four officials briefed on the discussion who described it on the condition of anonymity. They said Customs and Border Protection officials forcefully argued that agents who are apprehending migrant families at the border cannot refer all of the adults for prosecution because the Justice Department and other law enforcement agencies do not have the resources to process each case. 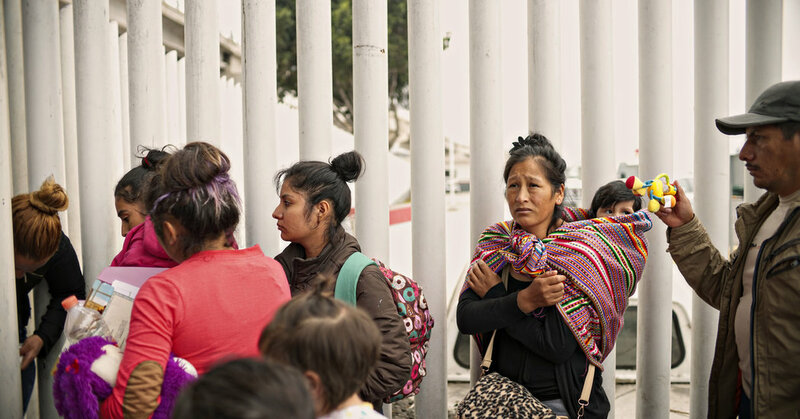 In particular, the border officials expressed concern about the number of prosecutors and judges needed to handle the proceedings, and the lack of space available to detain families while the cases go forward. As a result, the officials from Customs and Border Protection told White House and Justice Department officials that they have had to issue fewer prosecution referrals of adults with children despite the president’s “zero tolerance” policy on illegal immigration. Justice Department officials shot back, maintaining that the department has made no changes to its hard-line stance on illegal border crossings as it continues to receive referrals for prosecutions from Customs and Border Protection agents. Government lawyers will “prosecute adults who cross our border illegally instead of claiming asylum at any port of entry,” Sarah Isgur Flores, a Justice Department spokeswoman, said Thursday in a statement. The Justice Department has been combating reports about its ability or willingness to enact the zero-tolerance policy, denying that prosecutors have dismissed immigration violation cases in South Texas. Last month, Attorney General Jeff Sessions sent 35 prosecutors to the southwestern border to help handle the surge in cases created by the zero-tolerance policy; the Defense Department deployed an additional 21 lawyers to handle immigration prosecutions. Federal immigration courts faced a backlog of more than 700,000 cases in May, according to the Transactional Records Access Clearinghouse, or TRAC, at Syracuse University. In some courts, the average wait for an immigration hearing was over 1,400 days; some hearings are being scheduled beyond 2021 before an available slot on the docket is found. Lt. Col. Jamie Davis, a Pentagon spokesman, said the military is preparing to shelter as many as 20,000 migrant children on four bases: Little Rock Air Force Base in Arkansas; Fort Bliss in El Paso; Goodfellow Air Force Base in San Angelo, Tex. ; and Dyess Air Force Base near Abilene, Tex. It was not immediately clear on Friday if the parents could also be housed there. Customs and Border Protection officials said Friday that nearly 500 children who were separated since May have been reunited or will be reunited with their families by Sunday. These children were in the agency’s custody, never having been sent to facilities run by the Health and Human Services Department. It is unclear when the other 2,300 children will be reunited with their families. They have been separated from their parents since the zero-tolerance policy was announced. The children have been placed in facilities run by the Health and Human Services Department, some of them thousands of miles from where their parents are being detained. Administration officials said they have finalized a process to let parents know where their children are and to have regular communication with them after separation. Parents who are deported will be reunited with their children before being removed from the country, officials said. The president said a vote on immigration legislation should be postponed until after the midterm elections in November, when he expects Republicans to pick up more seats and create a stronger majority — a prediction that is far from guaranteed. But House Republicans are moving forward as planned with efforts to pass immigration legislation, said Representative Steve Scalise of Louisiana, the majority whip. On Thursday, the House voted against a hard-line immigration measure, and Republican leaders delayed a vote on a more moderate proposal, punting a decision on the bill to next week to give themselves more time to pick up support. The proposal, the product of weeks of negotiations between House Republican moderates and conservatives, would provide a citizenship path for the young unauthorized immigrants known as Dreamers and would keep migrant families together when they are stopped at the border. But Mr. Trump’s message swiftly undercut party leaders as they try to build enough support to pass the bill. Speaker Paul D. Ryan of Wisconsin had no immediate comment on Friday about the president’s change of course. Some rank-and-file Republicans — especially those who face tough re-election campaigns — are under intense pressure from constituents to pass legislation that would protect Dreamers, who have been shielded from deportation under the Deferred Action for Childhood Arrivals program, or DACA, that Mr. Trump moved to end last year. “I think it’s time for Congress to stand up and actually write a permanent legislative fix for DACA; it’s time for us to prevent this notion of taking babies from their mothers; it’s time that we should make sure we actually secure our borders,” said Representative Will Hurd, Republican of Texas, who has been pushing a bipartisan immigration bill that Mr. Ryan refuses to take up. Debate over the family separation policy turned into a tense standoff in the House on Friday, when Representative Ted Lieu, Democrat of California, played a recording of the detained children wailing and crying, as the presiding officer, Representative Karen Handel, Republican of Georgia, tried to shut him down. “The gentleman will suspend,” Ms. Handel demanded repeatedly, citing the chamber’s decorum rules. Mr. Lieu refused. “Why are you trying to prevent the American people from listening to what it sounds like in a detention facility?” Mr. Lieu asked. The recording ran for several minutes before he stopped it and yielded. Later Friday, Mr. Trump invited family members of those killed by undocumented immigrants to deliver personal stories about the deaths of their loved ones. Some died in car accidents. Others were raped, beaten or tortured before they were killed. “I’m one of your legal immigrants,” said Sabine Durden, whose son Dominic was killed in a crash. Mr. Trump introduced her by saying her story was an “incredible” one. Flanked by the so-called angel families, the president said the families had been “permanently separated,” a reference to the family separation issue. Reporting was contributed by Maggie Haberman from New York, and Eric Schmitt, Eileen Sullivan, Sheryl Gay Stolberg and Thomas Kaplan from Washington. Next story South Korea Draws Inspiration From 2002. Ah, but So Does Mexico.